There are many names given to India, out of those one is ‘World’s Hunger Capital’ only because there are many problems in the country and one of those major problems is hunger or insufficient food in each household of India. Every one in six people is hungry in the country. It’s not only the rural India which is hungry but the Urban India also, food prices have risen to a great level but not income to that level. Contrary to the image of protruding bellies, sunken faces, peeling skin and receding hairline, it is not easily visible. And it is a cruel irony that widespread hunger is reported in parallel with abundant food grain. It is a national shame. Child nutrition is a marker of the many things that are not going right for the poor of India. Thus, unpacking the hunger index at the level of the federal states is an important tool to build awareness of the disparities in hunger among them. In addition, the variability of the relative contribution of the underlying components of the hunger index across the different Indian states can help to stimulate the discussion about the drivers of hunger in different state contexts.Thus, India is still starving. India’s hunger shame – 3,000 children die every day, despite economic growth. Coming to the statistics, it is found that almost 230 million population in India is undernourished – the highest for any country in the world. According to the UN Food and Agriculture Organization (FAO), there are 100 million more hungry people this year, meaning they consume fewer than 1,800 calories a day. Malnutrition leads to almost 50% of child death in the country and majority of adults are reported to thin and underweight. India is among those top 29 countries tagged with highest level of severe poverty, endemic hunger, malnourished children and poorly fed women. Global Hunger Index shows India on the 16th number out of 56 countries. Hunger in India still remains the prime cause of death followed by Aids and Cancer. Over 20 Crore people in India sleep hungry every night. 10 million people die every year of chronic hunger and hunger-related diseases. Only eight percent are the victims of hunger caused by high-profile earthquakes, floods, droughts and wars. 990 of 1000 adivasis or tribal households experience chronic hunger. Over 7000 Indians die of hunger every day and Over 25 lakh Indians die of hunger every year. 30% of newborn are of low birth weight, 56% of married women are anemic and 79% of children age 6-35 months are anaemic and 90% of the population in India is born thalassemia. Resilience to build food and nutrition security is required. India is home to the largest number of hungry people in the world. There are several and often inter-related and inter-connected reasons for chronic hunger. Starting from the trap of poverty, more than 70 percent of population in India is below poverty line. They do not even have basic necessities of life that are food, shelter and clothing. How would they get it? They can’t because they do not have sufficient money. This makes them weaker and thus, they can’t afford food even. India's efforts to reduce the number of undernourished kids have been largely hampered by blighting poverty where many cannot afford the amount and types of food they need. When children are chronically malnourished, or ‘stunted’, it can affect their future income, condemning them to a life of poverty and hunger. Another reason can be seen to be lack of agriculture. India being an agrarian country, but there is still lack of investment in agriculture and agricultural infrastructure like warehouses, seeds, irrigation, enough roads etc. Thus, unless there is proper farming there can’t be proper growth of cereals or vegetables and so on. All conspire to limit agricultural yields and access to food. Climate and weather and natural disasters contribute to another reason. Natural disasters such as floods, tropical storms and long periods of drought are on the increase -- with calamitous consequences for the hungry poor in developing countries. Other reasons are war displacement, unstable markets and food wastage in hostels, hotels, parties, campaigns etc. 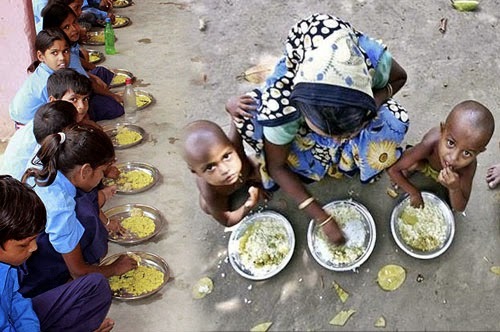 There are several measures taken by Indian Government to control hunger problems in India. They come up with and implement one yojana or another formed by Planning commission and other cabinet committees to eradicate this evil from its root. Pradhan Mantri Swasthya Suraksha Yojana is the one approved in the year 2006 that aims at correcting the imbalances in the availability of affordable healthcare facilities in the different parts of the country. Second in the list is National Rural Health Mission. It is an Indian fitness program for the betterment of health concern delivery across rural India. It is conducted by the Health Ministry. National Rural Health Mission took the initiative to eradicate poverty and help rural women improve their health. Third yojana in the pipeline is National Rural Livelihood Mission. A scheme of Government of India, under the Ministry of Rural Development, that focuses on poverty and ultimately eradicating all health and hunger problems as well. These were the main yojanas by the Government of India. Apart from this National Food Security Act, Rural Godown Scheme and Gramin Bhandaran Yojana are also being focused on.